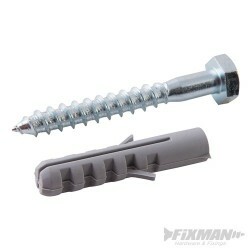 General purpose fixing kit for installation of satellite dishes and other installations in masonry and concrete. Zinc-plated for corrosion resistance. Hex head for easy, fast installation with socket driver. Interior or exterior use. Includes 4 x M8 x 60mm coach screws and 4 x M10 x 50mm plugs. General purpose fixing kit for installation of satellite dishes and other installations in masonry and concrete. Zinc-plated for corrosion resistance. Hex head for easy, fast installation with socket driver. Interior or exterior use. Includes 4 x M10 x 80mm coach screws and 4 x M12 x 60mm plugs.